Are you looking for a cheap and easy RM8 house clearance Dagenham services to dispose of your household rubbish? Is your home full of rubbish? Do you need to declutter your house? If the answer is positive then you have found the solution to your RM8 house clearance chores. 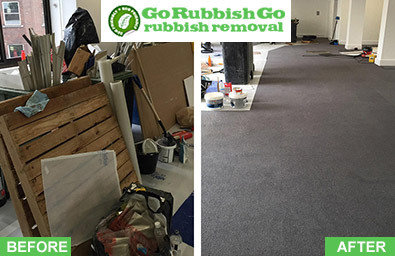 Go Rubbish Go offers a variety of top-notch clearance services at reasonable prices. We have many years of experience in this industry so we know how to deliver 100% customer satisfaction. 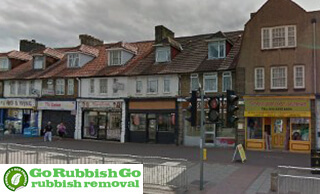 Hire us for house clearance in Dagenham and wave good bye to the pesky rubbish! We can come to your home and do the hard work for you in no time at all. All you need to do is call 020 8610 9182 and ask for a free quote! When you get in touch with us you will receive a free quotation with no obligation to buy. But we are confident that you will accept our quote because we offer the lowest Dagenham RM9 house clearance prices. We will help you dispose of your rubbish in a quick and efficient way without charging you the earth. Save money without having to lift a finger! We have lucrative deals to make sure that you will get the best value for money. We keep RM8 house clearance costs low because we want to be accessible to people of all budgets. Contact us now to get a service at a price you will love! We can offer you same day house clearance in Dagenham RM8 at competitive prices. We are based locally so we can respond to your call and be at you address in RM8 at short notice. Whether you need us to remove a few pieces of furniture or to clear out a 3 storey house, we can handle it all. We have a team of experts in Dagenham ready to take on any challenge. They have the latest equipment and vans to make sure you will get the most efficient house clearance service in London! Call 020 8610 9182 now and we can come to you in a matter of hours! We take pride in our eco-conscious Dagenham house clearance services. We take our commitment to the environment very seriously and try to reduce our carbon footprint with every job we take. We recycle more than 85% of the items we collect. Hire us and you can rest assured that you are not harming the environment. 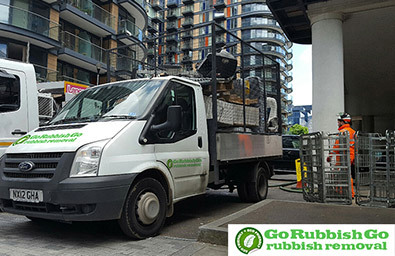 We strive to minimise the amount of waste that goes to landfills in London and we try to use the shortest routes when competing your house clearance RM8 tasks. This way we are not contributing to global warming. Go green by booking with us today! Are you worried about the safety of your possessions? Then hire Go Rubbish Go and stop worrying! We have the most reliable house clearance team in the whole of Dagenham. Our experts can come to your home in RM8, sort your items and load them in the van without damaging your property or disrupting your daily routine. We can clear out your home at a time and date that suits you. We are flexible and can help you dispose of your waste even on weekends and bank holidays. Whether you need to dispose of builders waste or garden shed junk, our RM8 house clearance company can come to the rescue. Book now on 020 8610 9182! We can customise our service to meet your house clearance needs and offer it at a price that fits around your budget. Our main goal is to deliver remarkable results. You won’t have to spend a fortune if you hire us for house clearance in RM8! We offer cost-effective services designed to help you get rid of rubbish in the safest and quickest manner possible. Our team are fully-vetted and well-trained to handle any amount or type of waste. Clearing out a house requires a lot of heavy lifting and hard work and our team have years of experience in this line of work. Don’t risk your health! Hire the experts in RM9 and save some cash! Dial 020 8610 9182 and take advantage of one of our great discounts on Dagenham house clearance RM8! Found in East London, within the Borough of Barking and Dagenham, Dagenham is a rather large suburban area that has witnessed a significant increase in population in the last decade. A sizeable part of the area falls in the Becontree housing estate and it also covers Old Dagenham village, parts of Becontree Heath as well as the Dagenham Dock that was a big coaling dock in the past and is still used today for river-related activities. There used to be five manor houses in the district but only Valence House has survived to this day and now houses a history museum. The Roundhouse pub is another local landmark that has hosted many rock-music concerts. Three tube stations, rail services and Transport for London services operate in the area.